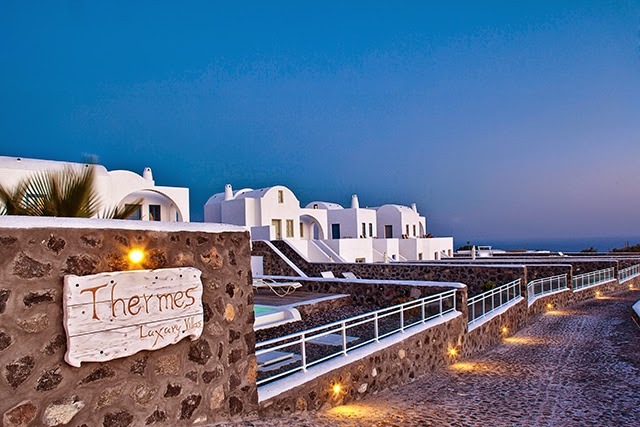 Boasting a magnificent location right on the edge of the volcanic Caldera, Thermes Luxury Villas provides guests with the ideal accommodation for utterly relaxing and romantic moments overlooking the breathtaking vastness of the Aegean Sea and the imposing volcano right in the middle. Choices vary as our Cycladic style properties cater for all tastes and types of visitors. If you are a couple in love then opt for our spacious Two Bedroom Villas offering ample spaces, top-notch bedding and decoration, as well as an in-room Jacuzzi for some extra pampering. Some of these villas also include a charming fireplace corner to add a more atmospheric touch to your amorous setting. Sip a coffee to pick you up or have a hearty breakfast in your private terrace admiring the famous Caldera. Equipped with comfortable furniture, sun loungers and wooden deck, the private swimming pool area of each villa is perfect for soaking up that all important Greek sun. Characterized by light colors, cozy atmosphere, intimate details and plenty of space our Three Bedroom Villas are ideal for guests seeking a more romantic note for their stay in Santorini. Sumptuous bedding, along with the elegant decoration create pleasant living areas to unwind in style. In some of the three bedroom villas guests will also find a cozy fireplace. What's more outdoor areas are more than inviting. The wooden-deck terraces are equipped with wooden furniture and sun loungers found next to the villa’s private swimming pool, offering unique views to the volcano and Caldera. For honeymooners and deeply in love couples, Thermes has created a divine property to make sure that lovebirds can experience unique moments of happiness, joy and entertainment. Perched on the cliffs of Caldera Princess Irianna Estate charms its guests with the stunning views to the sea, the volcanic islands, Aspronisi, as well as the settlements of Oia, Akrotiri and Imerovigli. Moreover, indoor spaces are decorated in earthy colors contrasted with luxurious red bedding adding a passionate touch! Follow Thermes Luxury Villas's board Thermes Luxury Villas on Pinterest. Nice post mate, keep up the great work, just shared this with my friendz Danilo Strickland I found this is an informative and interesting post so i think so it is very useful and knowledgeable. I would like to thank you for the efforts you have made in writing this article.